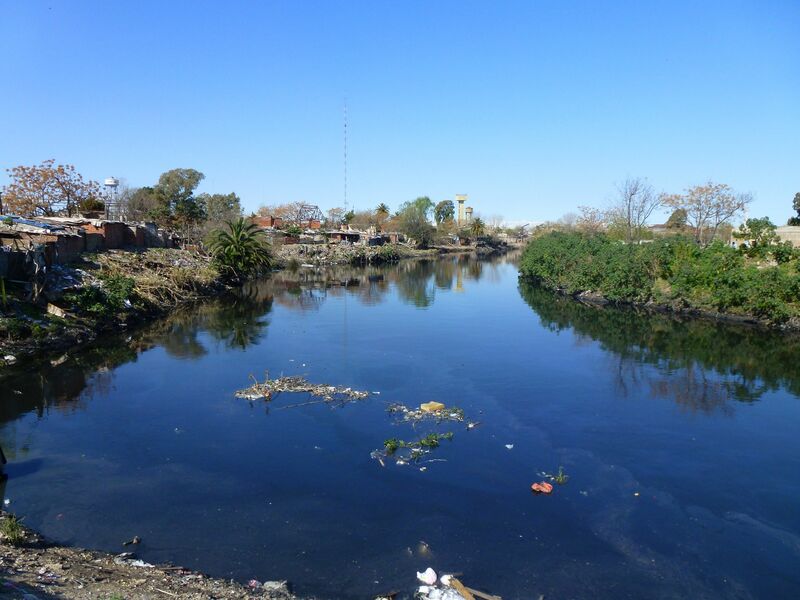 In my post of 14 September, Villa Miseria, I wrote, among other things, of the state of the Riachuelo, allegedly the most polluted river in the western hemisphere, as it passes through the slum of Barracas 21/24 to the south of Buenos Aires. At the invitation of FILBA, the Buenos Aires International Festival of Literature, of which I was a guest last month, I was invited to write a short piece on my visit to Barracas, to be read on the final evening of the festival, along with other pieces composed during the course of the festival by fellow writers, which can be found at the FILBA Blog. What I wrote was a poem about the river, in what is an unusually hectoring voice, as I was affected by a strong sense of outrage – quite apart from the social conditions of the people living in the slum – at how a river, which is traditionally such a potent symbol of live-giving purity, can become so vile and corrupt a thing as to breed ‘monsters of the mind’. I wondered what it would be like for a child to grow up by the side of such a river. I wrote this draft of the poem – which is clearly still unfinished – at short notice, specifically for performance at the event, and have not revised it, so it has a raw and unpolished feel to it. It is written in a mixture of English and Spanish because I liked the idea of a poem that played the two languages off against each other. A ‘medialuna’ is a cartwheel as well as the small sweet croissants eaten for breakfast in Argentina (though certainly not by the inhabitants of Barracas 21/24). The lines ‘Do you like this garden which is yours? / Make sure your children don’t destroy it // ¿Le gusta este jardín que es suyo?/ ¡Evite que sus hijos lo destruyan!’ are from Malcolm Lowry’s Under the Volcano, and his character, Geoffrey Firmin, becomes obsessed by the broader connotations of the phrase. The other Spanish phrases are either variations on this line or else echo the English. ¿Le gusta este rio que es suyo? ¡Evite que sus padres lo destruyan! Evite que . . .